This reusable tote folds into a small pouch when not in use so your customers can easily bring this bag along when they head out to do some shopping. When unfolded these these custom made bags are quite large and provides plenty of space. Your organization or company’s logo can be imprinted on both the tote and the cinchable pouch so your message gets across no matter what. Our eco-friendly Fold n’ Go Green cinchable folding totes feature polyester construction, so they can stand up to wear and tear and are recyclable. Since we have our own factory we eliminate the middle man which keeps costs down, and we pass this savings along to you. This means you can order high-quality, eco-friendly bags without breaking the bank. Our direct factory relationship also means you can further customize your tote to your exact specifications. 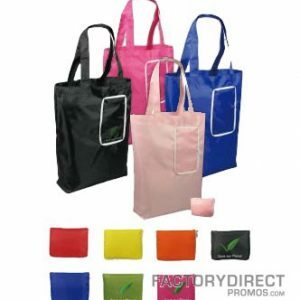 Select the colors, sizes, and more and we can create your custom bags for a low wholesale price.